San Francisco: Information technology (IT) firm Hewlett-Packard Co. (HP) may get acquisitive again despite its recent absence from the technology sector’s merger and acquisition (M&A) scene, analysts said, and Brocade Communications Systems Inc. may be a prime target. Brocade makes routers and switches for blade servers, as well as software to help companies manage data efficiently. It has been expanding its partnerships and already sells equipment to HP, International Business Machines Corp. (IBM) and Dell Inc.
Analysts say HP’s sprawling portfolio has cushioned it against the shock of the IT spending downturn, but that investors now want to see the world’s largest computer company move to ramp up growth. Some say one way to do that is through acquisitions. Aaron Rakers, analyst with financial services firm Stifel Nicolaus, said HP is likely looking to acquire in areas such as software and networking, to complement its ProCurve networking product. 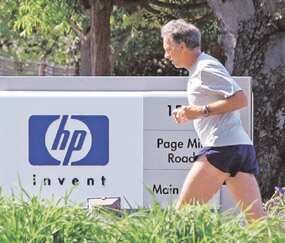 HP has been relatively quiet on the M&A front, Rakers said, given that the firm is still working through last year’s blockbuster $13 billion (around Rs61,360 crore) acquisition of Electronic Data Systems Ltd.
“As we roll out into the next couple of quarters, I wouldn’t be surprised to see them do something," he said. Shaw Wu, analyst with investment banking and advisory company Kaufman Bros Lp, said HP and its rivals are focused on offering customers an end-to-end suite of products. Cisco Systems Inc. recently began selling computer servers targeted at data centres, pitting the company against HP and IBM. “It makes sense for HP to add to its portfolio in two areas: one is networking, the other is software," Wu said. “The more software and the more networking that they do, the better the margins." Wu said Brocade would be a good fit for HP, noting that an offer for Juniper Networks Inc.—another tie-up much speculated on in markets—the No. 2 networking equipment maker after Cisco, would be a bolder and more expensive move. Juniper’s market capitalization of roughly $13.8 billion is more than three times that of Brocade. F5 Networks Inc. is another networking name that crops up in acquisition talk. As the IT sector has stabilized, the economy steadies and credit loosens, M&A has been picking up. Last week, Cisco agreed to acquire Norwegian videoconferencing company Tandberg ASA for $3 billion, leading analysts to wonder whether HP would respond. There were also major deals in an IT services sector that analysts say is ripe for consolidation: Dell’s $3.9 billion bid for Perot Systems Corp. and Xerox Corp.’s $5.5 billion play for Affiliated Computer Services Inc.
HP has a formidable war chest of $13.7 billion in cash should it decide to deal. It has made at least 45 acquisitions since 2001. Besides EDS, major deals in recent years include the $4.6 billion acquisition of Mercury Interactive Corp. in 2006, and the $1.5 billion purchase of Opsware Inc. in 2007—two of the more than two dozen software deals HP has made since 2001. The company wages battle on many fronts in the IT sector, from Dell and Acer Inc. in PCs, to IBM in services and servers, to printers. Brent Bracelin, analysts at technology investment banker Pacific Crest Securities, said last week that HP has been in “digesting mode" with EDS but added: “I would expect them to get back into an environment where they become much more aggressive as they enter 2010." “HP isn’t in a position where they’re going to be left out of the consolidation race," Bracelin said. HP has been tightly managing costs as it works through the EDS deal. It expects to generate $3 billion in savings by the time the integration is complete. Rakers said the services sector deals in recent weeks provide more evidence that HP’s purchase of EDS was a smart one. “The EDS stuff was validated, if you look at the multiples that Dell’s paying for Perot," he said.